I’ve been editing editing editing, but I think I need to step away from the manuscript for a day. It’s very hard to stop though. The sooner it’s perfect, the sooner I can rest the sweet rest of those who have handed in an edited book. This is another still from Beauty and the Beast. Beauty is sitting in front of the mirror in her bedroom, angsting about I forget what. But it’s a fairly accurate picture of how burned out I feel. I downloaded a horror movie called The Orphanage. I’m going to try to stop working and watch that. Just because of you, I had to get the DVD of “Beauty and the Beast” (I had it on VHS a long time ago and loved it)…it’s visually so beautiful. Thanks for jogging my memory. 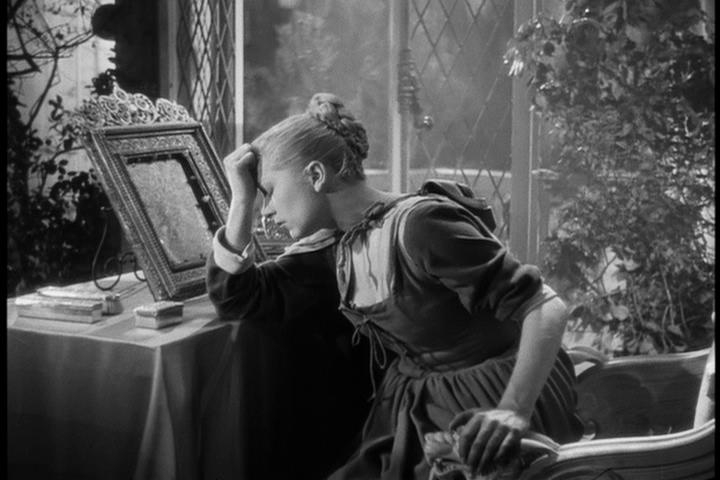 And you’re right…there are so many wonderful, dramatic still images. You’re welcome! I should get the DVD. Does it have good extras?